Echoing sentiments expressed by Julian Assange at South by Southwest Interactive two days ago, exiled American whistle-blower Edward Snowden and fellow panelists today suggested that tech giants such as Google and Facebook may be forced to hand over civilian data when the United States government asks. "I took an oath to support and defend the Constitution, and I saw the Constitution was violated on a massive scale," Snowden said, recalling his days at the National Security Agency. "Would I do it again? Absolutely. Regardless of what happens to me, this is something we had a right to." When asked why people should be more concerned with federal agencies collecting personal data as opposed to digital companies, he pointed to national governments' ability to limit a person's rights, adding "they can kill you, they can jail you, they can surveil you." Piped in through Google Hangouts, Snowden shared the virtual stage with his lawyer, Ben Wizner, and ACLU technologist Chris Soghoian. Their discussion included pragmatic moments, citing the fact that consumers give up a lot of privacy when they agree to use free digital services. Snowden said that even tech firms with business models that lean on collecting data about their users can "do this in a responsible way." "It's not that you shouldn't collect the data," he said. "But you should only collect the data and hold it as long as necessary." Soghoian said he thinks people would be open to roughly pay $5 a month for a more secure Internet experience. "The tools we use," the ACLU rep said, "are made by advertising companies. This makes NSA's job a little easier. [But] advertising companies are not going to give us tools that are secure by default." 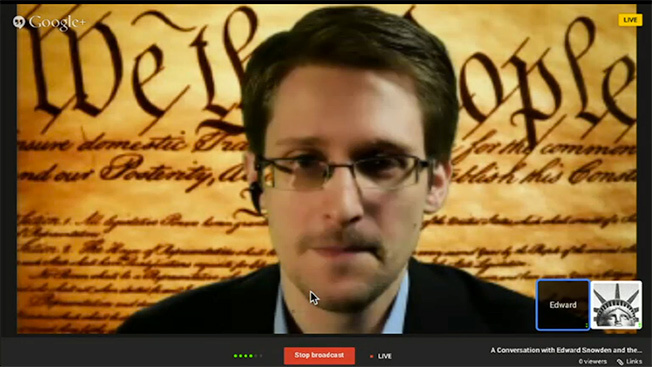 Soghoian also quipped, "The irony that we are using Google Hangouts to talk to Edward Snowden is not lost on me." Snowden was at ease while addressing a U.S. audience for the first time since he became known for his efforts to leak NSA documents. Several of his statements were met with rounds of applause. Soghoian declared, "There are going to be people here and at home who think what Ed did was wrong. [But] his disclosures have improved Internet security." A major part of Snowden's message—when it was his turn to speak—was that technologists can fix digital security/privacy issues. Those hoping Snowden would hold court for an hour today—similar to Assange's performance two days ago—were sorely disappointed. The whistle-blower ultimately got equal time with Soghoian and Wizner, as all three called for consumer digital experiences to be made more secure through encryption technology. This should not be a panel discussion that happens to have Ed Snowden. It should be a talk by Ed Snowden. Meanwhile, the appearances by Assange and Snowden haven't exactly made the vibe in Austin this year seem marketer-oriented compared to South Bys past. While there are scores of ad world panels taking place that would counter that notion, switching out keynote speakers such as Foursquare chief Dennis Crowley and Scvngr/LevelUp CEO Seth Priebatsch for data privacy hawks can't help but affect the event's overall tone. For instance, in 2012, Priebatsch wowed his audience with company's data-driven plans in conjunction with American Express. In hindsight, that almost seems like a different conference. If nothing else, the overarching privacy/security theme underscores that SXSW Interactive is evolving into a much broader annual discussions forum. For instance, there's a complete sports track now that includes sessions with folks such as Texas Tech head football coach Kliff Kingsbury. And if continued, how such wide-reaching programming plays out in the years to come will be worth watching.